The Walking Dead television show has grown into something of its own beast. While it’s still following the comic in a few respects here and there, for the most part it’s taken a path all its own. The show has made a lot of its changes through characters who weren’t around in the comics, but occasionally they make changes to comic characters that are for the better. Case in point: Carol. In the comics, her character never really amounted to much of anything. In the show? She’s easily become one of the most important characters. And for good reason; she’s pretty darn awesome! McFarlane Toys has seen fit to add Carol to their line of figures based on the show (and there was much rejoicing!) I’ll be taking a look at that figure today. 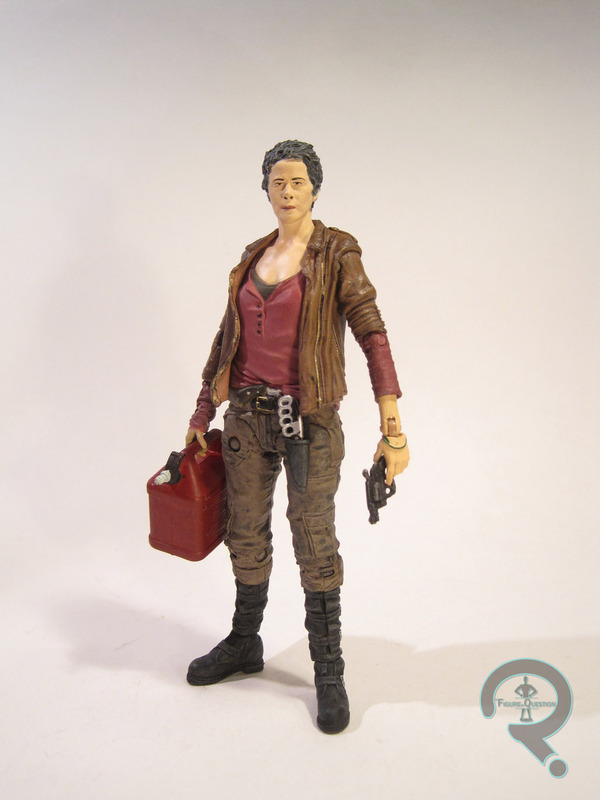 Carol was released as part of Series Six of McFarlane’s TV-based The Walking Dead line. The figure is just shy of 5 inches tall and she sports 25 points of articulation. Most noteworthy, she has the new style of hip joint, first used on Daryl, which is a serious improvement over the Series 4 figures. Like many of the characters on the show, Carol’s look has gradually evolved. 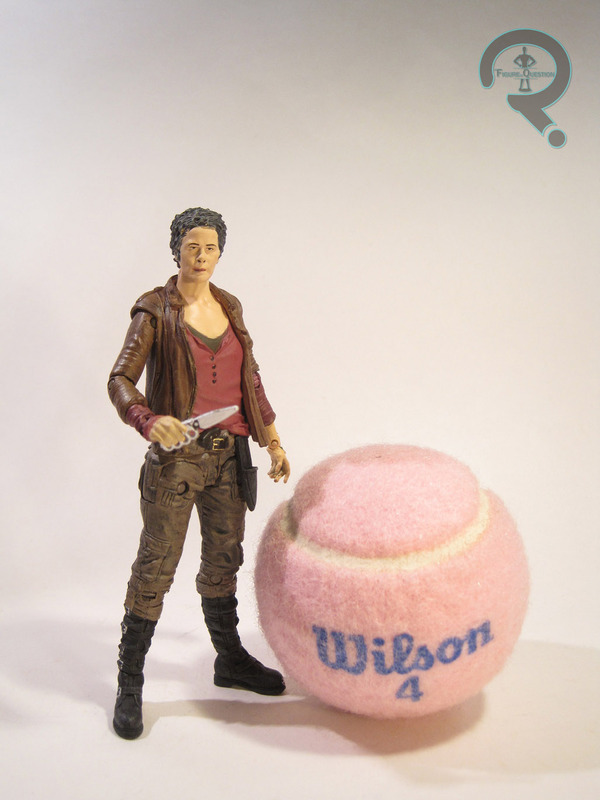 This figure is based on her look around the end of season 4/ beginning of season 5. It depicts her after she’s grown a bit more comfortable in the post-apocalyptic world. Gone is the really close cropped hair; in come the combat boots! It’s a pretty great look. In order to facilitate this look, McFarlane has given Carol an all-new sculpt. I have to say, I’ve warmed up to this sculpt a fair bit since first getting the figure. That aside, the sculpt isn’t quite as good as some of the others in the line. Overall, the proportions aren’t too bad, though she still has the skeletal looking wrists that plague most of the line. Most of the issues are with the head. It’s not terrible, though it seems to lack some of the more attractive features of Melissa McBride’s face. I can’t really point to anything specific, but something seems off. I don’t know. Another reason that diagnosing troubles with the sculpt is difficult is the paint work. The face really seems to get the worst of it. The eyebrows seem a bit misplaced and the eyes are too small and too close together. Also, her hair has too much black in it, which just further throws off her look. The weirdest bit of the paint is the black dots on her nostrils; I’m not sure what the idea was here, but it just ends up looking strange. All that said there are areas where the paint is magnificent; some of the detail on the clothes is really great. Carol is packed with a revolver (which is also sculpted tucked into the front of her belt), he signature knife, and a gas can, which has actual, readable instructions on how to use it! That’s quite impressive. Carol was purchased from Cosmic Comix, my comicbook store of choice. I’ve been anxiously awaiting the release of the Carol figure pretty much since she was announced, so I picked her up as soon as I saw her. While I have a fair share of complaints about the final figure, as a whole I think she turned out okay. She looks nice with the rest of the group and the figure’s really started to grow on me since getting it. 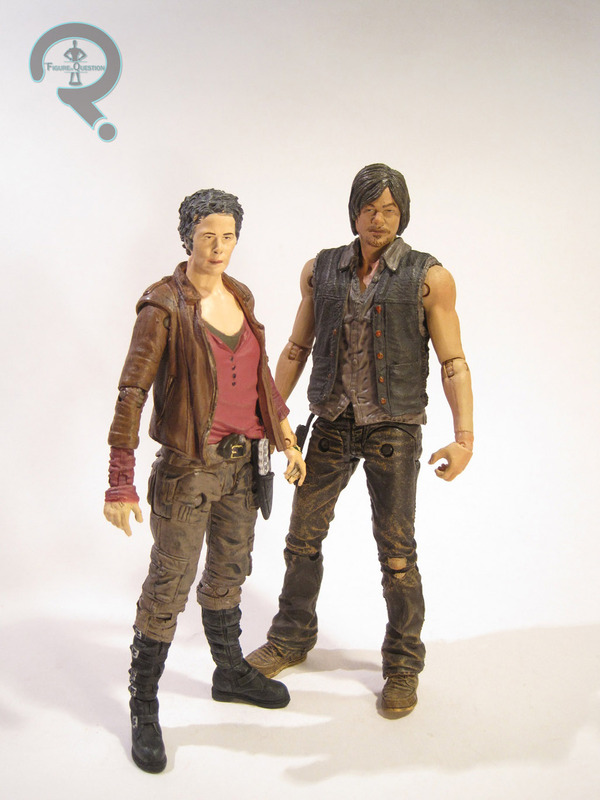 Need a better quality 10″ Carol to go with the 10″ Daryl!